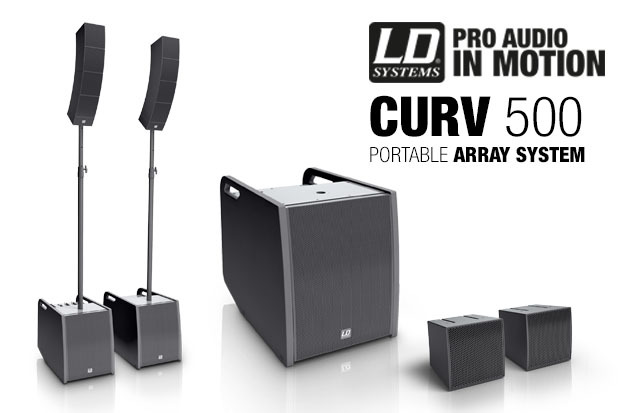 Compact, lightweight and high-performance PAs like the Curv 500 from LD Systems are the friend of every musician without roadies. We took the Curv 500 ES version from the modular system components and put it to the test. With its Curv 500 PA system, LD Systems is pursuing a modular approach. The system components include an active bass subwoofer with an integrated mixer, an active slave bass subwoofer and satellite modules. What makes it special is that, once attached, the top parts form a banana-shaped top array – an arrangement described by technicians as ‘curved’, explaining the product name. The aforementioned components can be put together in monophonic and stereophonic configurations for different purposes. Pre-configured sets can also be selected. LD Systems offers the PA system tailored to the planned use in three different configurations. The Curv 500 ES (ES = Entertainer Set) is designed for entertainers and smaller bands. It comprises the active bass with a mixer plus four satellites and has 460 watts RMS power. Depending on requirements, the set can be used in mono or stereo mode. The AVS version (AVS = Audio Video Set) is designed for smaller home cinemas, pubs and bars and comes with the bass subwoofer, including mixer and just two satellites. These are designed for stereophonic sound. The PS configuration (PS = Power Set) is also stereophonically designed. This comprises two bass subwoofers and eight satellites. With 960 watt RMS power, entertainers, DJs and bands can project sound in even medium-sized rooms. In the case of unplugged music with a guitar and vocals, use is even possible in slightly larger rooms. The satellites can be used individually or in groups. Up to four boxes are joined using the ‘SmartLink’ system, connecting them both mechanically and electrically. The enclosure shape results in the aforementioned curved structure commonly seen with line arrays on larger festival stages. On the Curv 500, the curvature creates a dispersion angle of 110 degrees horizontally and 10 degrees vertically. The large horizontal dispersion angle carries the sound to a wide audience, even when not directly in front of the speaker. The low vertical angle minimises reflections from the floor and ceiling. The Entertainer Set tested here can be set up in stereo mode with one or two satellites per channel or in mono mode with up to four satellites. By purchasing more top parts, up to four elements per side can be used in stereo mode. When permanently installed, the little satellites can also be attached to a wall. For mobile use, they are attached to a spacer rod on the bass speaker or to a separate speaker stand. The Power Set allows for even more flexible use. Here, in stereo mode, every channel has its own bass speaker and four satellites. 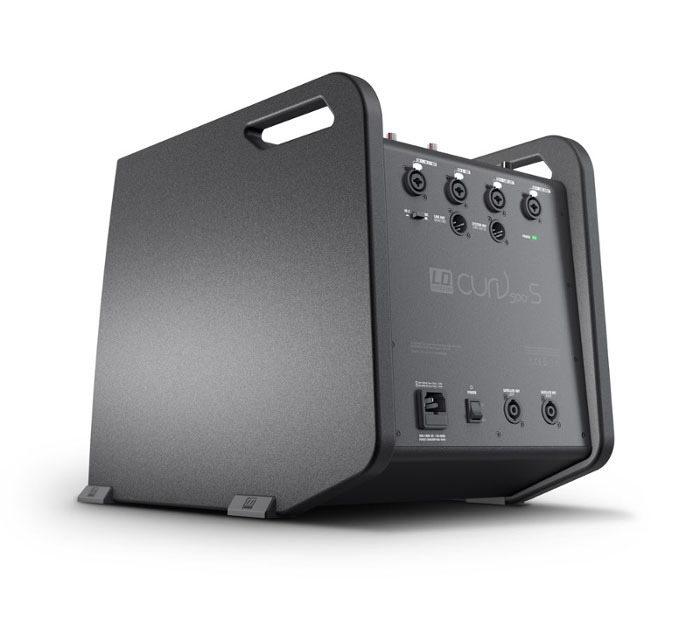 The Curv 500 ES’s subwoofer contains a 10-inch bass speaker and all the electronics including a mixer. The connections are fitted to the back of the box. In total, four channels with four combo sockets are available. The input sensitivity of channel 1 can be switched between microphone and Hi-Z using the rotary knobs. Instruments with both an active and a passive sound pickup (e.g. acoustic guitars) can be connected here. Channel 2 is a pure microphone input. A constant supply voltage of 12 volts for the phantom powering of condenser microphones is at the XLR sockets for channels 1 and 2. Both channels have a gain controller, a two-band EO and a level controller for the integrated effects processor. This provides eight hall, two delay and six dual-FX programs. The latter combine hall and delay as well as hall and chorus. The effects are of a high quality but cannot be programmed. Channels 3 and 4 have been combined to form a stereo channel designed for a keyboard, audio player, PC or smartphone. The connectivity options are correspondingly diverse. A keyboard is connected via the combo socket, an audio player or computer via the mini jack socket and a smartphone via a wireless Bluetooth connection. EQ and effects are not available for this stereo channel. The master section of the mixer can be used to adjust the overall volume and subwoofer volume, select the effect program, define the number of satellites per channel using the rotary knob and switch between mono and stereo mode. 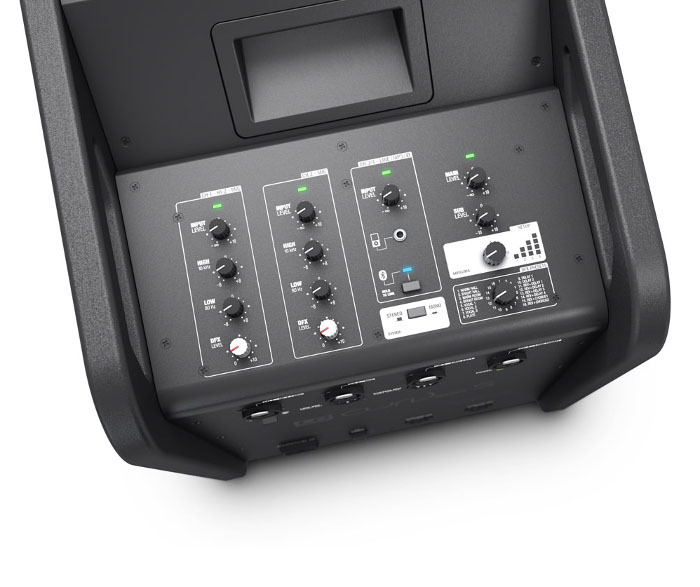 In addition to the four input sockets, the back of the bass speaker also sports an XLR line output and a multi-pin XLR socket labelled ‘System Out’, to which the Power Set’s aforementioned slave bass can be connected. The sub and overall volume settings on the main device are transferred to the slave subwoofer so that the slave system follows the master device’s settings. Two Speakon sockets can be used for connection cables to the satellites. While the successful design and compact structure of the Curv 500 are already highlights, the sound is the cherry on the cake. It is pleasingly warm, full and transparent with a pleasant punch. The treble is clear but not harsh, the bass powerful but not mushy and the mids present but not intrusive. Whether for keyboard, guitar or vocals, the EQ rarely had to be touched during the test. This is a good report for the PA’s basic sound. Acoustic guitars sound beautifully crisp, while the vocals are present and clear to understand. This pleasingly applies at both low and high volumes. With keyboard sounds, you should naturally note that you can’t expect any stormy bass from a 10-inch subwoofer, and in a band, people don’t want to come up against an entire, thunderous drum set. However, users are optimally equipped to meet the standard demands of live music for entertainment purposes and, when using the correct structure, can benefit from the far-reaching dispersion of the top parts interlocked to form an array. Its modular concept and the integrated mixer with two mono and one stereo channel(s) make the Curv 500 ES suitable for versatile use. Whether for fixed installation in a pub or as a mobile companion for entertainers: the Curv 500 looks great in any situation. Users can also choose whether the entertainer, AVS or power version is most suited to their needs. Of course, the AVS and ES models can naturally also be retrofitted. And it’s all available for a surprisingly good price and, as such, we at the editorial department are delighted to give it a clear recommendation.